California leads the nation in the number of people getting insurance through the Affordable Care Act. But now that the final deadline has come and gone on Tuesday, millions are still left uninsured. These people will still turn to community clinics and public hospitals for care -- they are the safety net institutions that serve Californians with nowhere else to go. But as the ACA is implemented, those institutions are facing changes. One such place is Centro Medico. It's tucked away in a corner of a shopping center in Cathedral City, a predominantly Latino bedroom community sandwiched between the resort towns of Palm Springs and Rancho Mirage. Here is where many hospitality workers who serve the neighboring resorts live. Centro Medico's manager, Daisy Morfin, sees a lot of pent-up need for medical care. Since enrollment in the Affordable Care Act started last fall, she says the clinic is getting up to 10 new patients a day. Many are people who have qualified for health insurance for the first time in years -- or ever. Right now, the workload is heavier for everyone, but Morfin’s not complaining. She believes that after these new patients get their needs met, the volume of appointments will drop, and she’s happy to see them taken care of. Joanna Ramos thinks so too. She's a counselor at Centro Medico. Under the Affordable Care Act, people can get help in obtaining insurance in two main ways. One is through expanded Medi-Cal, the state's version of Medicaid. It's available at little or even no cost to people who are low income. The other is through Covered California, the state's marketplace for private insurance. Those who qualify can get a subsidy to help them pay for insurance. And millions of Californians have signed up -- more than 1.2 million in Covered California and nearly 2 million in Medi-Cal. The problem is that some people say that even with the subsidy, the insurance is not affordable. The clinic also sees a lot of patients who are undocumented, a group that’s explicitly excluded from getting insurance under the Affordable Care Act. People who remain uninsured are at risk of not getting care they need. Safety net clinics and hospitals all over the state, like Centro Medico, are facing new challenges in serving them. Dr. Gary Gray is a family doctor and chief medical officer at Natividad Medical Center in the Monterey County town of Salinas. “We’ve always taken all comers without regard to payer source,” he says. From almost every window at Natividad you can see row crops. A large number of patients here are farmworkers. Monterey County is projected to have the second-highest proportion of uninsured people in the state as the Affordable Care Act is implemented. (Number one is Los Angeles county.) Historically, state and federal programs compensated safety net hospitals like Natividad. Now, as more patients obtain insurance, that funding is being cut. That puts more pressure on hospitals like this one to hold onto the patients who now have insurance in order to subsidize those who don’t. In some ways, Natividad may be in a good position to meet that challenge. The hospital has focused on welcoming the county’s most needy patients for years. The cafeteria is filled with beautiful photographs of local produce many of their patients pick. 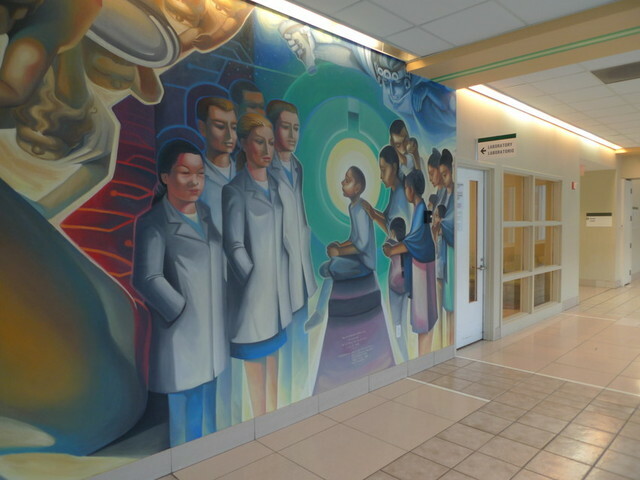 Hallways are lined with Mexican-style murals featuring patients, doctors, and MRI machines. Over the last several years the hospital expanded its specialty services like pain management, dermatology, and spine surgery. “Some of those services weren’t previously available to our patients in Monterey County at all,” Gray says. Lisa Morehouse reported this story for the 2014 California Endowment Health Journalism Fellowship, a program of USC's Annenberg School for Journalism and Communication.